As the lead singer of the popular Southern California rock band “The Tijuana Dogs”, Matt Mauser has been entertaining audiences with his unique style since the late 90′s. As the Tijuana Dogs grew in popularity, the band was often asked to perform at weddings, corporate parties, and events that required a more sophisticated style of music. It was during that time when Matt fell in love with the music of Frank Sinatra. Mesmerized by Sinatra’s smooth voice and unequaled phrasing, Matt memorized the subtleties in each song Frank sang. In 2005, Matt Mauser and Pete Jacobs were introduced by “The Tijuana Dogs” guitar player Dave Murdy. 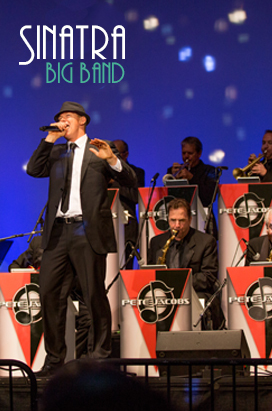 Dave was performing double duty playing in Pete’s big band “Wartime Radio Revue” and with “The Tijuana Dogs”. In 2011, Matt approached Pete with the idea of starting a Frank Sinatra tribute band. Pete, without hesitation said, “Let’s do it!”. They immediately went to work charting music, recording vocals, and rehearsing with the big band. Their collaboration captures Sinatra at the height of his career when singing with The Count Basie Orchestra at The Sands hotel in Las Vegas. Matt’s vocal style and Pete’s genius as a conductor are a tribute to the two greats coming together.